Need more apps for your favorite device? iOSnoops can help! Here are 40 iPhone, iPad and iPod touch apps that have just gone free. 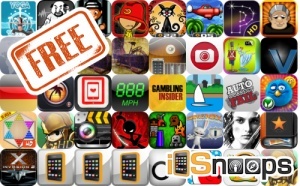 This apps gone free alert includes Pictorial, Staunch Defense, Jungle Crash Land, Cat Physics, The Fluffies, Defense of Fortune, Bongo Touch, Sam & Max Beyond Time and Space Ep 1, Doodle Fire, Jailhouse Jack, Discovr Music, and many others.